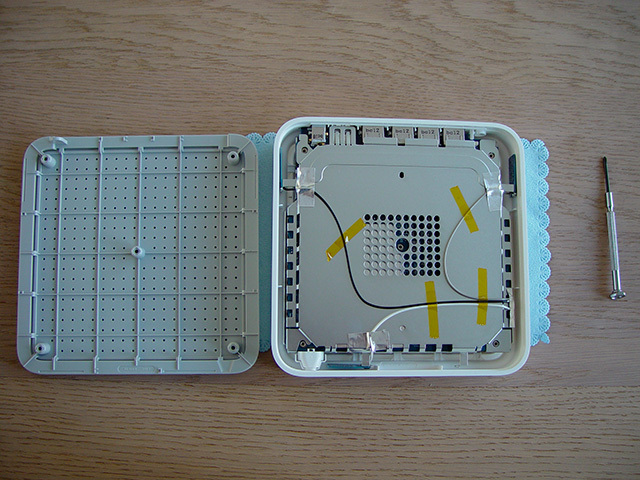 Update remark: A pre-2013 model Airport Extreme wireless router was used in this HowTo, but this guide can be applied to just about any WiFi router. The latest Airport Extreme (2013) is much taller, making it less suitable for mounting it to a wall. You want to install your Apple Airport Extreme Wireless Router most efficiently without compromising it’s good looks nor it’s WiFi reach. Since it doesn’t come with a mounting bracket, unlike earlier Airports, you could order one from the US Apple Store or others for about €30 / $45 or more. I couldn’t even find it in the European Apple Stores. Besides that I think these prices are way overrated for such a simple piece of plastic and I don’t want to wait for days until it arrives anyway. 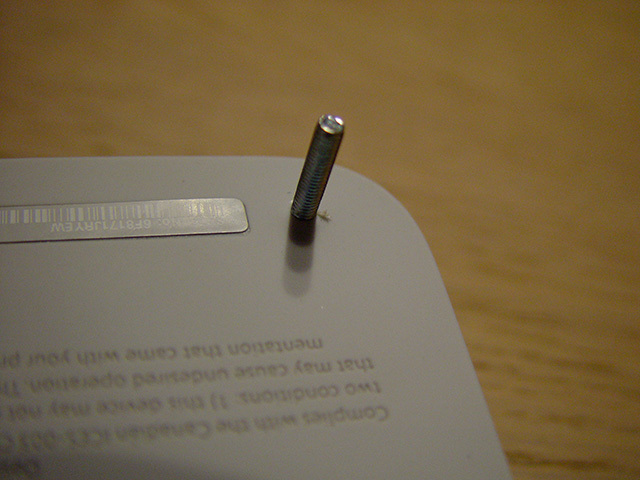 If only Apple had created a few mounting holes in the back… Fortunately, this is not very hard to fix yourself and I have already figured it out for you! First of all, determine the area where the hardware will be that will be using the wireless part of the Airport. Think of it as a circle, drawn around the outer limits the WiFi devices might be when you use them. Ideally, the Airport Extreme is in the center of this imaginary circle. Then the vertical position: Higher is better. Determine obstacles like metal radiators, metal doors and doorjambs, etcetera. Concrete walls often have steel in them that make them even harder to pass for wireless signals. You don’t want to mount your wireless router in a metal meter box or right behind a metal doorjamb, as metal dampens the signal. Try to stay clear from microwave ovens. ‘Gigaset’ wireless home telephone sets may interfere with WiFi too. Obviously, you’ll also have to take in consideration where the modem is, since you’ll have to connect to it with a UTP patch cable. Finally the router needs power from it’s adapter, so if there’s no free power socket near it, you’ll have to create one. Don’t worry: there is no place without some obstacles. Places without obstacles, like open fields, usually even have a worse radio reception, because the signal doesn’t reflect on any surface. If you want to be sure you picked a good place, first try it out without mounting it. The cables of many houses and offices usually all come together in the meter closet. 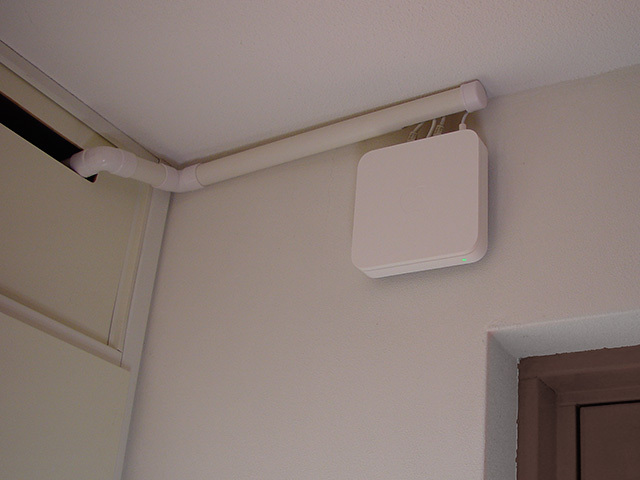 Since mine had a metal doorjamb, I decided to mount the Airport Extreme to the wall, outside of the closet. The white Airport looks nice on the white wall and by using the also white PVC pipes you can keep the cables out of sight and tidy. 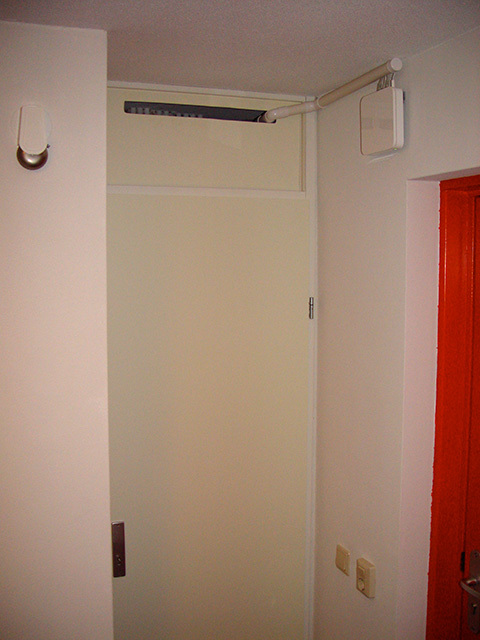 These white plastic pipes and corners can be found in any Do-It-Yourself shop, building supplies store or local plummer for just a few euros or dollars. Since the Airport Extreme doesn’t come with a mounting bracket and lacks any holes in the bottom to hang it to the heads of a few screws, we’ll have to make something ourselves. First of all, you’ll need a small philips screwdriver, a small plain screwdriver, two M3 screws, 6 M3 bolts, a small piece of plastic or wood sheet and a soft cloth. Depending on your type of wall, you’ll need a drill and some screws and plugs to hang the Airport to, for now I’ll asume this needs no further explanation. Hang ’em wifi routers high! 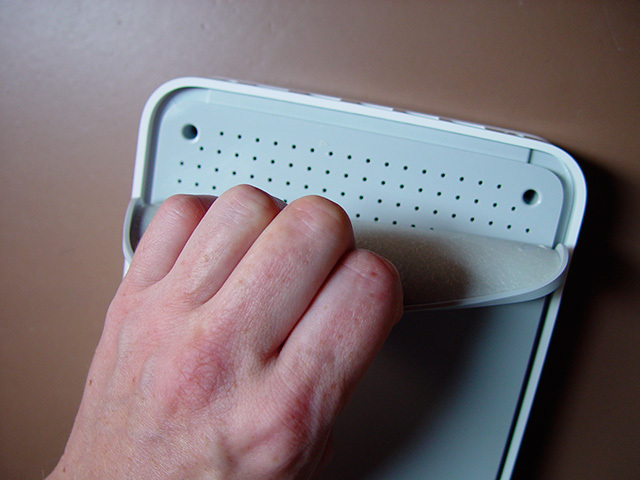 Put the Airport Extreme upside-down on the cloth to prevent it from scratching the front surface. 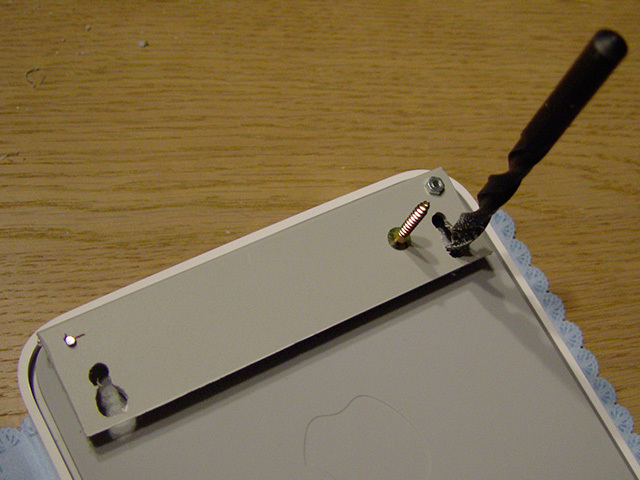 Then peel off the rubber layer on the back far enough to reach the holes where the screws are. There’s one in every corner and a fifth, right in the middle, so you’ll have to peel it off quite a bit, but don’t worry: the double sided tape that isused will stick it right back. Once you’ve opened the Airport, you’ll see there is not much space lost unused. Hanging it to some screwheads by drilling a few holes is no option. Fasten them from the outside and cut a small cross in the rubber where the original screws must be put back, so you can still use the screwdriver through the rubber incision. Of course you don’t want to do this with the Airport underneath it, it is just to demonstrate sizes on the photo. Use a vice to fix it while you drill. Use a 3 mm drill to drill two holes first and then make the lower one larger by using a bigger one. The size depends on the size of the head of the screws you use to put in the wall. 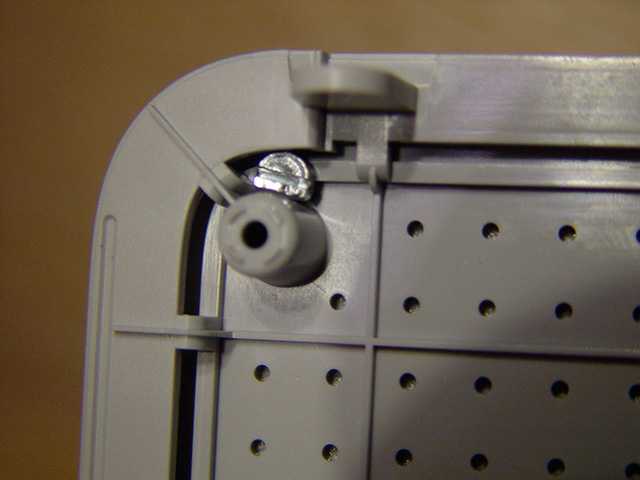 Use another two bolds per screw, one before and one behind the mount to fix it at the end of the screws. Use a small piece of foam plastic or wood with the same thickness and some double sided tape to fix it to the other end of the back of the airport, so the whole of the back will be at an even distance of the wall. Enjoy! Don’t hesitate to contribute any thoughts or comments.